Legendtina and crmsnsnwflks like this. That is quite a lovely cover! I wonder why she hasn’t appeared on the cover of US Vogue yet. Beautifully styled, and I'm happy Brie is finally getting some love from bigger editions. 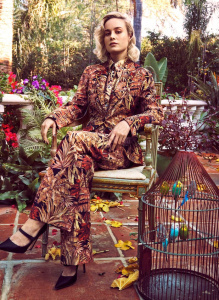 But that background looks fake, and stealing ideas off Vogue with the little bird on the shoulder? Not a good look, sorry Laura. new year... whole new Brie. Still the best executed mainstream fashion magazine on stands. I think I like it, it's fresh. But it speaks volumes that she is on the cover of InStyle and not on Vogue with such a big role. I’ll take it! This will pop at the newsstands for sure. Laura is doing a great job! Not sure about this background. The bird is not necessary and the I dont like the hair. However I still like this somehow, maybe because I love Brie so much. I like how Brie is finally getting attention from fashion magazines but... WTF IS ANNA THINKING!!! THIS SHOULD BE HER COVER!!! I'm gonna lost all respect for her if she gives to Biebergarbage couple the March cover. Very pretty. She deserves her own Vogue cover is right. Brie is one of those actresses who don't do it for me in print! The x Factor she has on screen is lost in print, and while this not perfect either, it's easily her best cover to date! Laura just gets "it", and what her magazine is about, high gloss, celebrity, commercial. She doesn't seem to be taking herself or InStyle too seriously, and it works. TZ001, dodencebt, MON and 1 other person like this. 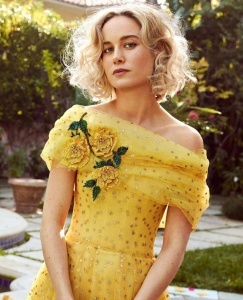 Best portrait I've seen of Brie, I love the hair. 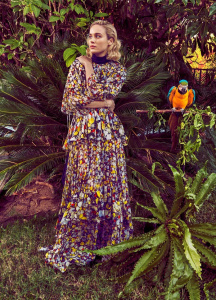 But the background, the bird, the ick 80s prom dress??!! I hate when they use simple lines like “The Fashion Issue.” With a name like InStyle, every issue should be “The Fashion Issue,” so maybe something a little less generic... Or let’s atleast throw Spring in there, “The Spring Fashion Issue” makes a little more sense, since technically the September issue is THE Fashion Issue. It just bugs me when magazines are so lazy, while they’re dying, not trying to revive themselves. Rant over. crmsnsnwflks and Miss Dalloway like this. Glenda Bailey feels very attacked right now. Take it from Graydon Carter who may have produce overly produced and commercialized covers, but captivated readers with his taglines. Hermiola and crmsnsnwflks like this. Brie is like Alicia Vikander to me: I absolutely love her, I find her beautiful, talented, charming on screen, very stylish (Alicia only in her street style due to LV though) but somehow they are not made for print work where they can't transmit as much as they can in movies. This cover is okay and I like the editorials with all the animals involved, the strong colours and mix of prints but I wish Brie had given us a couple of smiles! It would have brighten up the whole story. I don’t like both the cover and the editorial. They look too busy for me. Given that she’s rarely seen on the pages of glossy magazines, they should’ve gone with a more understated, sleeker approach. A series of black and white images with looks that put great emphasis on cuts and tailoring would’ve been a lot more stellar than this parade off kitschy florals.